Steam power was replaced by diesels on First Class 195/196 in the closing days of 1957. 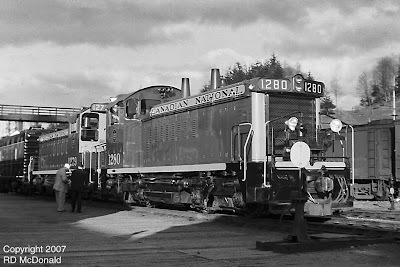 At first, a passenger train power pack was a pair of SW1200RS’s plus a Steam Generator Car. However, the short wheelbase of the SW1200RS’s – a mere 22 feet between truck centers - gave the crews a wild ride. I remember my first trip on those locomotives; I was alarmed by the roll, pitch, and yaw of these engines at mere 40 miles per hour! Needless to say, the road crews must have had choice words about the assignment of these units for the "geniuses" back at Western Region Headquarters in Winnipeg! And very soon, Geeps replaced the short wheel based units. However, like the predecessor's, the GP-9’s were not being erected with steam generator units. So a Steam Generator Car (Unit) was required for basic passenger comfort, including light, heat and electricity! 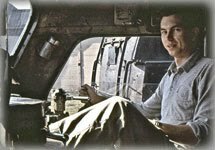 In order to utilize these units, a selected number of GP-9's were outfilled with contol and monitoring equipment in the cab, with a corresponding control cable connection on the locomotive. From what I can determine, Canadian Car & Foundry built a gaggle of these Steam Generator Units. 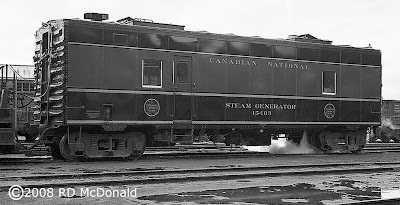 In addition to CC & F, General Motors Diesel Limited (London Ontario) built Steam Generator Cars. I believe this is good example of one of those, with the round port holes. As I said in the beginning, I am distressed that I did not document these units. In fact, this is the only shot I took of a unit sitting by itself at the Prince Rupert Engine Facility! I did very well with builders’ plate information and locations on locomotives; film type, ASA, shutter speed and so on. But remember, I was a mere lad of 14 years old, and did not comprehend the importance of notations for photos, especially when I began to share them 50 years later! I found a color photo of one of 15403's sisters in a detailed roster. The rectangular windows, confirms her as CC&F. Here is a unit built for the Canadian Pacific Railway. If you have information about these cars, please respond in the “Comments” below! I’d love to have more photos and especially technical information about these cars. Railroad stuff: Canadian National 15403, built by Canadian Car & Foundry in 1956.